The Art Foundation has the appearance of a compound, one whose thick red walls echo those of the old city you left behind. But these walls harbor a different type of activity altogether. The sprawling space that lies beyond these walls are entirely dedicated to contemporary artistic creation and experimentation. Launched in 2009 by Jean Louis Haguenauer, the Montresso Art Foundation initiated an expansive patronage program through an ambitious program of residency and exhibitions in a purpose-built space late in 2016. The vast art residency area has a feel of a mini United-Nations of art. 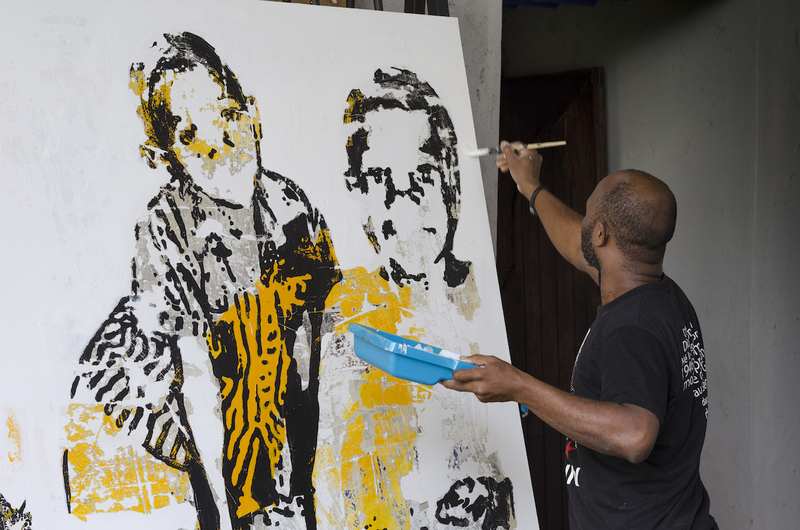 Gopal Dagnogo, the French-Ivorian artist, takes me on a tour of the residence where a young French artist is adding the clothing details to one of his three large-scale paintings. We walk past Russian artist Yuri Averin’s vivid abstract geometric paintings before a brief stop at Maya-Ines Touam’s quarter, where two of her arresting photographs, a contemporary reinterpretation of 16th century still life genre, are on display. Along the way, the walls of the communal areas, are silent witnesses to the work of past residents: Congolese artist Kouka’s figurative paintings on jute bags lay preeminently in one of the lounges while Ishola Apko’s photography series, Daibi are displayed in one of the offices. At the end of last year, five artists from Ivory Coast, under the patronage of art curator Yacouba Konate, were invited to attend the residence, and subsequently exhibit their work in the second act of In-Discipline, a traveling exhibition encompassed in 1:54 Contemporary Art fair’s citywide art program. The result is a group show, teeming with a variety of styles and materials, which is probing a wide range of contemporary issues, and almost constantly twists between past, present, and future. Joachim Silue’s towering sculptures made of wood and mirrors, when investigating the myth of Narcissus or barbed wire when examining mental slavery are situated at the beginning and the end of the show. Positioned as opening and closing arguments, they are metaphors for our mental constructions and the way they contribute to shaping individuals and how they engage with the world. Central to these mental constructions are our belief systems and the myths that make up our origin stories. Gopal Dagnogo’s has summoned the spirits that inhabit traditional religions’ shrines and drawn their representations in white on large-scale black cloth and smaller canvas. His contemporary take on classical fresco may appear chaotic at first sight. However, it is worth treating the chaos as an invitation to unpack this rich cultural and visual heritage. Also, if these black canvases were the physical manifestation of a collective imaginary where past and present collide, this is how lively and effusive you would want it to be. 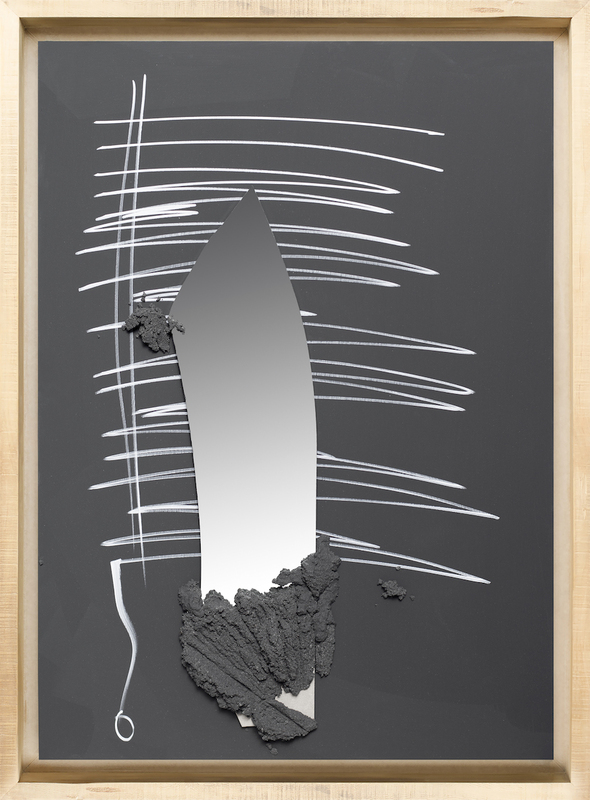 Yeanzi, Untitled, In-Discipline, Montresso Art Foundation, Marrakesh 2019. Past and present relentlessly overlap on Yeanzi’s canvas. 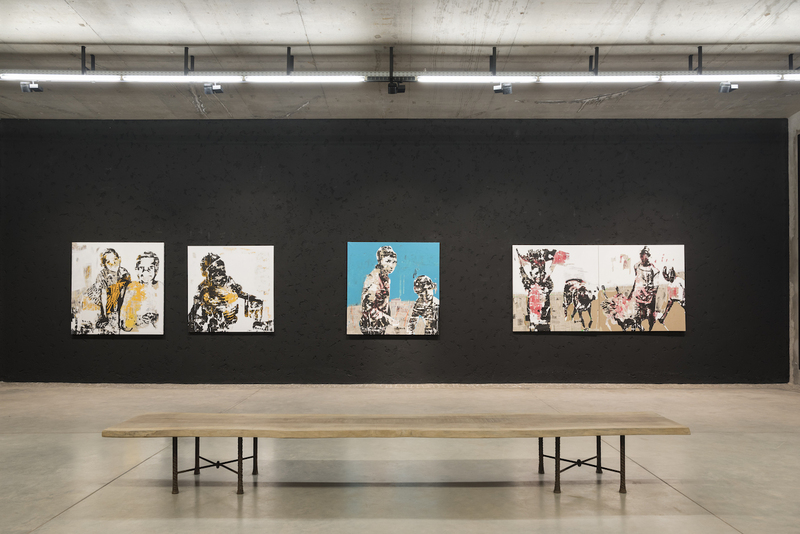 Faces and silhouettes emerge from melted plastic dots on the canvas against a background that references ancient and recent history. Identity, claimed or not, denied or not, is a mixed and fluid construct of past and present. The burnt marks are a vital reminder that the encounter of past and present, of traditions and modernity, has most often than not been violent. Violence reverberates through the figurative work of Armand Boua. He has centered his practice on the depiction of homeless children in Abidjan, called “enfants de la rue,” literally translated as children of the streets. Their numbers swelled in the 2010s when Ivory Coast when through a deep political crisis. A decade later, the children are still in the streets, forgotten by a society that is now eager to display the symbols of its newfound stability and economic prosperity. The children have found a premium place on the canvas of Armand Boua. 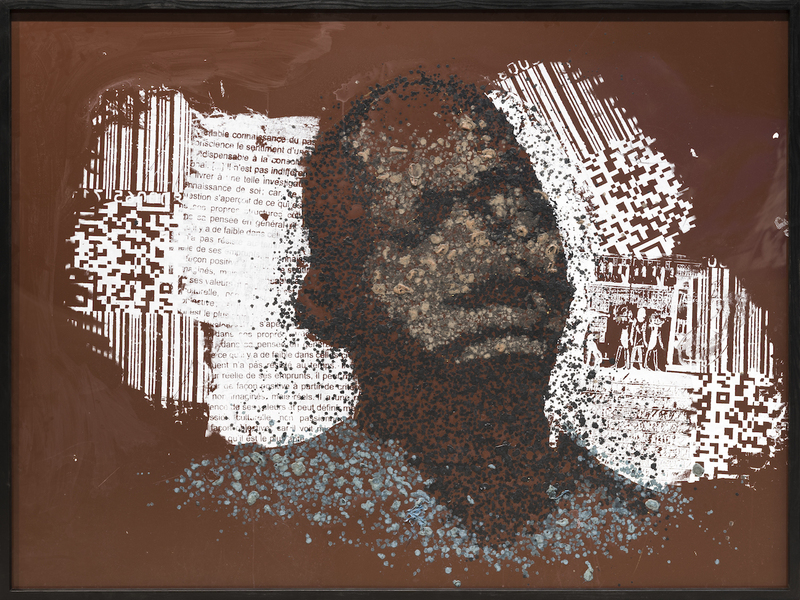 His poignant portraits made of slashed paper encapsulate the violence the children endure in the streets and their resilience. Provided this young generation overcomes such a grim start in life, there is another hurdle on the horizon. 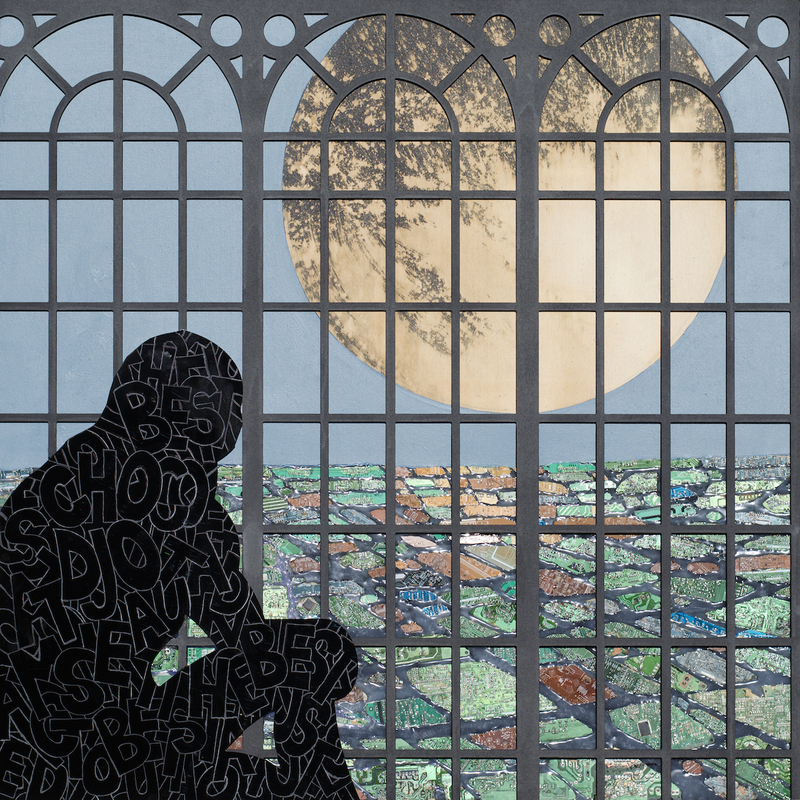 Pascal Konan outlines the terrible toll our current lifestyle is taking on the planet through five mixed media artworks. Au Clair de la Lune, (the title of two of his work) a beautiful French baby rhyme, has been transformed into a requiem with the moon bearing dangerously low. Low enough for a child to mournfully rests his head on it while the waste of our ultra-technological life turned into city map, gleams in the distance. Although most of the topics and pictorial elements are rooted in the cultural heritage of Ivory Coast and by and large Africa, the exhibition has a universal echo. The themes of economic disparity, a search of identity and mental constructions that run through the multidisciplinary artworks reflect contemporary issues of our globalized world. According to Claire Guinet of the Montresso Foundation, the exhibition is set to travel to Rabat from Juin 11th to July 3rd and further afield perhaps in Abidjan and a European City. There is no denying that there are still numerous obstacles in the way of Black or African artists developping their carreers and getting the recognition they deserve. However art initiative such as this one contribute to levelling the playing field and making their work accessible to a broader audience. After Benin in 2018, Ivory Coast was the point of focus of the second act of In-discipline, we can’t wait to see what African country the Foundation will turn its attention to next. It will all be revealed at the 3rd edition of 1:54 Contemporary African Art Fair in Marrakesh in February 2020. See you there. For more update on Contemporary African Art, follow us online on Instagram, Facebook, and Twitter .